Join us for some virtual travel. We have added more photos to the Ecuador album...enjoy! When we woke up at the high altitude of Quilotoa it was cold. I shuffled over to the bathroom and turned the left tap on the shower...ice cold. Most of the guesthouses here that have hot water use tankless heaters. Well aware of how tankless heaters work I waited a few more seconds...still cold. Damn, it would be a no-shower day. Over a breakfast of eggs, bread, jam, fresh fruit juice and instant coffee we talked with fellow travelers at the guesthouse. One solo French woman we met now has the record of being the most traveled person we have met. She is in her early sixties and her face is well worn with deep crows-feet emanating from the corners of her eyes. She told us that ten years ago she went traveling for 6 months. Every year since she has been traveling again – each time a bit longer than the last. This year she returns to France for only 5 weeks! After breakfast we put on all of our layers, hat and gloves and headed out with our travel companions; Simon and Rachel - a friendly couple from the UK, and Emilie and Michael – a couple from France who were married on the same day as Penny and I and were on their honeymoon too! The walk from Quilotoa to the village of Chugchilan is about 4 to 5 hours. The trail leads down from the crater rim across a valley and up the other side. We had decided to do the walk with no guide. We had two sets of directions. The guidebook warns of persistent guides at the trailhead so I was on the lookout...but the only person we saw was a slow moving old man who pointed us in the right direction. The walk took us through some spectacular landscapes of thickly forested cliffs, terraced fields, steep switchbacks down near vertical cliffs, over small rivers and through a village so small it had no place to eat (but the shopkeeper was kind enough to make us cheese sandwiches). We got lost a few times but always ended up back on the right trail. Have a look at the photos. We arrived in Chugchilan tired but satisfied. We stayed at Mama Hilda's guesthouse - a friendly place with nice rooms and private bathrooms (with hot water this time!). We have added a new photo Album - Ecuador - enjoy! After a short stay in the town of Latacunga, we headed back to the bus station for another bus ride deeper into the central highlands of Ecuador. Our destination was Quilotoa Crater which is an extinct volcano whose crater now holds a lake. The crater is at an elevation of over 3,800 meters. Getting there required that we take a bus to the small town of Zumbahua. From there, we hopped on the back of a pick up truck that would take us the rest of the way. The pick up ride turned out to be more comfortable than the cramped and overpacked bus ride. Once at the crater, we settled into a small and basic guesthouse. We left our large pack and headed to the crater rim to take the 45 minute hike down to the lake. Once at the rim, we were able to see the crystal aqua blue waters of the lake. We started the descent into the crater in mid afternoon. The walk down was scenic and relatively easy but the return trip promised to be a lot more challenging. We quickly realized that the majority of hikers were opting to take horses or mules back up and the few who did not were huffing and puffing their way up. Once down at the lake, we took a few minutes to enjoy the views and to make the difficult decision of whether or not to take the mules back up. At first, the decision was made for us as there were no mules available. But as we prepared to start the hike up, an 11 year old boy showed-up with two tired mules. He quoted us a price of USD $5 per person. Unfortunately, my fear of heights was getting the better of me and I was not keen on taking the mules. I know how much they like to walk close to the edge and I was not sure I could put my trust in them. But the alternative looked long and painful! With a strong push from Joseph and against my better judgment, I reluctantly agreed to get on the back of one of the mules. On our mules, we headed up the crater wall with the young boy who was on foot. He kept up with the mules the entire time encouraging them up the steep slops with a couple of taps and the constant “Machu Machu” (kind of like giddy up). Speaking to the young boy, he told us that this was his third trip up and down the crater that day. He also planned on making a forth trip to pick up another couple we met as we were making our climb. At $5 per person, his daily take in of $40 was very good when compared to the fact that the minimum wage is $148 per month in Ecuador. Thankfully, other than a couple of hair raising moments (mainly do to the fact that my mule was hungry and ready to go to any lengths to get to the green grass) we made it safely up the crater in 45 minutes. After the hike, we headed back to our guesthouse. At this point, more and more tourists starting showing up. At dinner in the guesthouse's common room, we talked to two other couples who we had originally seen in Latacunga. We realized that we all planned on completing the same five hour hike from Quilotoa to Chugchilan the following morning. We quickly agreed to complete the trek together and leverage our combined navigational ability to make our way there. From the Galapagos, we returned for one more night in Quito. From there we hopped onto a bus the very next day and headed into the central highlands. After a couple of hours we were in the town of Latacunga. The GAP Tour we did of the Galapagos was nice – but we were looking forward to what we consider real travel. Where you have total freedom to set your own itinerary, do what you want when you want to. The cost of that is that you have to find your own way around and decide for yourself what to do. Fortunately, Ecuador has a good bus network and since we speak Spanish it's easy to communicate. As an aside – theft seems to be a big problem here. Compared to our travels in Asia we've heard of many more travelers getting their money, passports or cameras stolen. The buses are a favorite place for thieves and every bus driver and local person we've talked to on the buses here has made sure to warn us to keep a close eye on our bags. Ecuador is the only country we've been to that bags are never put in the storage area under the bus or above the seats – the risk of theft is too high. Latacunga was where we made final preparations for the next part of our trip – hiking in the central highlands. We quickly headed to the market and purchased some essentials. Two hats, two pairs of gloves and a scarf for a total of USD $9. According to our travel guide and other travelers, the nights were cold in the central highlands. While at the market, we were hoping to get a picture of one of the traditionally dressed women merchants. Unfortunately, every time we asked we were turned down. The common excuse was “Soy muy viejita” - I am very old! The town also had a great Italian restaurant that served freshly made pizzas and great pasta and lasagna dishes. The Buon Giorno restaurant was a great stop for dinner. 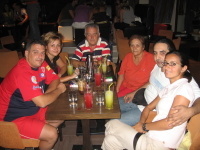 Through our travels in Ecuador we have been astonished at the quantity and quality of Italian restaurants. We attribute this to the fact that Ecuador is a cheese making country and the people are familiar with all the ingredients necessary for a good Italian dish. Next stop, the Quilotoa Laguna! Please see the Galapagos album... Enjoy! This time around Joseph and I did a little more trip pre-planning. With only three weeks we wanted to ensure that we were being efficient and limited the amount of time we spent planning while in Ecuador. Therefore, for the first time, we booked a GAP Adventures tour from Toronto. The tour consisted of a 3 night 4 day stay onboard a boat that sailed to different islands in the Galapagos. The tour began in Quito where a GAP representative picked us and 14 other travelers up at our hotel. We were driven to the airport where we boarded a flight to the Galapagos via Guayaquil. After a few hours, we arrived in the Galapgos where our guide Luis met us at the airport. The first thing that struck us was the sweet smell of the air in the Galapagos. It was fresh, sweet and invigorating. We got our bags and headed to the port town of Puerto Ayoro where we boarded the 16 person boat - GAP Adventurer III and enjoyed lunch. We and the other travelers were cared for by a crew of 7 and 1 naturalist guide. We all had double rooms which consisted of bunk beds with a small private bathroom – I got the top bunk. The accommodations were comfortable considering that we were on a boat. For the next few days we took in all that the Galapagos had to offer. We visited the Darwin Research Centre were we came really close to giant tortoises that were being raised in captivity. The centre focuses on managing the hatching and raising of baby tortoises of all varieties that are found in the different islands. Baby tortoises are held at the centre for about 4 years at which time their shell is strong enough to protect them from predators and are released on their respective islands. The highlight at the centre was seeing Lonesome George – an approximately 100 year old tortoise that is the last of its subspecies. After being discovered, George was brought to the centre while researchers searched for a lady friend for him. Alas, George is still waiting for a girlfriend of the same subspecies... During our visit, care takers at the centre went into Goerge's pen to give it a scrub. From the looks of it George was not very happy with this and constantly snapped at them. He would extend his incredibly long neck and open his mouth wide trying to get a piece of them... Fortunately for the care giver, George is very slow! After an overnight five hour cruise, we reached the island of Floriana where we experienced a chance of a lifetime – snorkeling with sea lions. We suited up with our snorkel gear and jumped into the water. The water was clear and we had great visibility. We first spotted some beautiful tropical fish and a graceful sea turtle. As Joe and I swam hand in hand, out of nowhere a young sea lion came within inches of my snorkel mask. I let out a scream! And then again, the sea lion was back and swimming circles around us. I once again let out a scream but this time a scream of joy... For about 5 minutes, we were surrounded by three sea lions. They were incredibly playful and curious. During our trip in the Galapagos we had the chance to swim with sea lions, sea turtles, white tip sharks and many other species of marine animals. The nights on board were not always easy. The water was choppy and we traveled at relatively high speeds. After dinner, we usually spent some time at the upper deck bar enjoying a beer with the rest of the travelers. We shared travel stories and talked about home. Most people were shocked to hear that we were married on Saturday. As we shared stories one night, Luis our guide drew our attention to the back deck of the boat. On the edge of the deck, a young sea lion was perched and started scratching himself on the rough surface. It seemed so natural for him! Our favorite island on the trip was Espanola. The island was what I imagined the Galapagos to be or at least what I had seen on the National Geographic Channel. Most of the perimeter of the island is sheer vertical cliffs where albatross and blue footed boobies nest while the remainder of the island consists of white, green, red and black sandy beaches. We enjoyed watching the water hit the rocks and spew up in the air as the albatross and other birds jumped off the cliffs (or as Luis called it “the albatross runway”) and circled around to spot their next meal. What made the Galapagos a unique experience for me is the relationship that exists between human and nature. It is a relationship of mutual respect and of trust that cannot be experienced anywhere else. I hope that the national park will be successful in all its efforts to preserve this experience. Although our One Year Away ended more than a year and a half ago, we are back on the road... Only for three weeks this time around. As a result, we are getting back into our old habits and will be blogging about our adventures in Ecuador, the Galapagos and the Florida Keys. Many of our friends and family asked “were does a couple go on their honeymoon when they have been around the world?” Our answer was Ecuador and the Galapagos. Our love for trekking, nature and wildlife was what pushed us to book this trip. What is better than swimming with sea lions and watching large tortoises slowly slugging their way through life. Only 36 hours after getting married, Joe and I were off to the airport. Getting ready for the trip had taken a back seat to wedding planning, therefore, Sunday night and Monday morning were very hectic with packing. We loaded our new top-loading backpacks with all the necessities for life at sea and on mountain tops. We used all the learnings from our last trip to pack as light as possible, this resulted in both of our packs coming to less than 12 kg each. My parents who were still in Toronto drove us to the airport. During the ride, I let my mom know all she needed about Dexter: how much he eats, when he poos, what toys he likes... They have been kind enough to take him to Montreal for three weeks. After a lengthy inspection at customs which is always relatively unpleasant, we got to our gate. At 10AM we were in our seats getting ready for take off... Wanderlust had been calling for a while now. I just hope that three weeks will be enough to appease her! After 11 and half months, 20 countries, 20 flights and countless train, bus, taxi, ferry, tuk tuk and motorcycle rides we are back home. It’s a great feeling to be in Canada surrounded by family and friends – not to mention wonderful things like soft beds, fluffy towels, supermarkets that stock cheese and high speed internet access. We left Greece for the return home like two people with personality disorders. We felt equal parts; happiness to be returning home, disbelief that this was really our last flight of the trip, excitement and anxiety for what lay ahead and a twinge of regret that what had been the most amazing year of our lives would end when we touched down. From speaking with other long-term travelers we’d been told that we would probably experience something they call “reverse culture shock”; that is a feeling of not belonging in your own country and a period of unhappiness that follows the return home after a long trip. Well, we’ve been back for 3 weeks now (yes, I was really slow getting this post up) and I’m happy to say that we’ve had no reverse culture shock. Our return for two weddings at the end of June and then 6 weeks in Europe were a good way to ease back into a more western way of life. Penny returned to her job already and is diving back into her work with a vengeance. I decided not to return to my position at an energy company and am looking at entering the fast growing field of clean-tech. I think the decision to leave a great company and a job I enjoyed was sparked by some of the things I saw on this trip. The thick, brown, polluted air of Chinese cities and the scheduled rolling blackouts of India were like a kick to the head. I realized I wanted to be part of the solution and luckily it’s an industry with a lot of opportunities right now. So what will happen to oneyearaway.com? We plan on posting a few more times on our re-entry to Canada, buying our first house and getting settled back to normal life. But after that we’re not sure. If you have any suggestions please let us know. 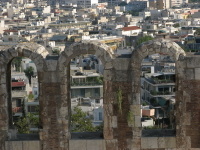 We've added a Greece photo album. Enjoy! Most of my family in Greece are from the Peloponnese's area. Although many have moved to Athens, in August almost everyone returns to their home towns where they spent their childhood. 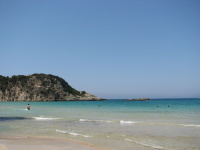 This is a great way to escape the chaos and noise of Athens and thanks to the great beaches in the area it is also a great way to escape the heat. After northern Greece our stop was Agia Sotira, the village of around 40 full time residents where my mom grew up. We were greeted by my uncle Thodori and aunt Kostoula (a.k.a Maria - don't ask) at the bus station in Kalamata. After many hugs and kisses, we hopped into the car and were driven past beautiful beaches and thousands of olive and fig groves to the 'xorio' (meaning village in Greek). There my uncle has inherited the family home and he has spent a lot of time and energy upgrading the place. I barely recognized it after being away for only two years. He had completed lots of stone work on the wrap-around patio. He removed all the vines and plants from near the house and for shade extended the terra cotta roof. The decrease of greenery next to the house also significantly decreased the number of bugs (particularly grasshoppers) that get into the house! We greeted Ketty (Thodori's wife) and the kids, Thanassi who is seven and Maria who is three. 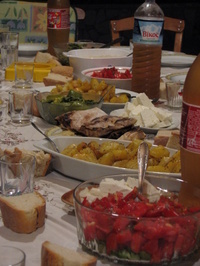 The first order of business, like in any Greek home, was to eat. Within minutes of being there we had a Greek salad, rice, cheese and beef patties waiting for us on the kitchen table. As we ate, my family members had loads of questions particularly for Joe. Unfortunately, there was a communication barrier. Joe does not speak Greek and my family speaks little to no English. Therefore, I became the official translator. I rarely had my own conversation. Most of my time was spent translating conversations between Joe and my family. While at the village, we attended both nights of the 'panigiri' which is the yearly village festival. 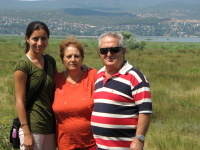 There we were joined by my aunt Voula, her husband and my cousin Nancy just to name a few. 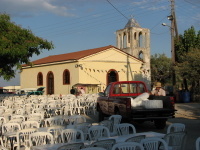 The village square which is next to the small church and cemetery is packed with tables and chairs. A few hundred people showed up and enjoyed a live band, beer and 'wurnopoula' - roasted pig that is served with bread and salt. We had a great time but Joe did have some difficulty getting used to the screeching sound of the clarinet, which with the 'bouzouki' consist of the most important musical instruments used in traditional Greek music. The time at the village was very relaxing. We spent most of our days going to beaches around the area, sleeping in the afternoon and going out for large meals in the evening. Joe did manage to also spend a few hours playing farmer with my uncle. Both went to the family olive groves to clear the fields of weeds and to water the trees. We also took the opportunity to learn about olives and olive oil. We visited the village's olive press and oil making facility and my uncle and seven year old cousin walked us through the process. Although the facility is high tech, the process remains straight forward - you pick the olives, you wash them, you press them and you remove all water/moisture from the pressed olives and you get olive oil! While in the Peloponnese's area we also visited my god-daughter and her family who were vacationing at their family home and to visit my dad's home town of Militsa. There we met with my over-90 year-old great aunt who is going strong. Of course she insisted that we stay for a 'meze' (Greek equivalent of tapas) and wine. 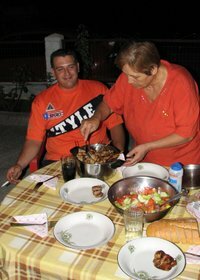 Joe made sure to eat and drink everything he was offered to make sure that he did not offend Giagia Olga. After seven days in the village we were heading back to Athens to catch our flight to Canada the following day. We promised to return to Greece and to do so during the olive picking season. We promised Thodori to help with the olive harvest and to earn our share of the oil the family produces! Thank you to everyone who welcomed us and we hope to see you all soon! Leaving behind the nightmare of dealing with AlItalia to get Penny's lost bag returned, we caught a bus to Kilkis; me with my full backpack and Penny with the clothes on her back and one extra T-shirt she bought. Whenever Penny thought about her bag of clothes lost somewhere in Italy she sent me a resentful glower, then went back to watching the hilly, dry landscape that characterizes this part of Greece. Other than that the 7 hour ride was uneventful. We were greeted in Kilkis by Penny's cousins, Maki and Dimitri. Although I'd never met them before, they greeted me so warmly I felt like a long lost brother. Their equally warm parents, Penny's Thea and Theo (aunt and uncle) were waiting for us at the small family-owned apartment building where the whole clan lives. I was then introduced to a Greek national pastime; sitting on a balcony or terrace while drinking frappee (a delicious whipped cold coffee). We talked while drinking and I got to know the family. 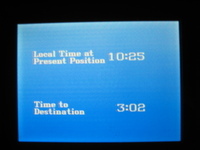 Penny provided live two-way translation the whole time and was talking so much she hardly had time to sip her coffee. Maki spoke english very well from having spent some of his childhood in Canada and then working on a resort in Crete, so we were able to talk without a translator, which was great. Kilkis is a town of about 30,000 people that is 1 hour north of Thessaloniki, near the Serbian and Bulgarian borders. It is surrounded by rolling hills, industrial parks and agricultural villages. While it's no metropolis, it has a surprisingly good night life. The main strip in Kilkis has cool restaurants, bars and cafes that rival those in Athens; in quality if not quantity. For those familiar with Montreal, it's like a mini-version of St. Laurent Blvd. Not exactly what I'd expected coming to a small town in northern Greece. We went out for dinner to a taverna (traditional Greek restaurant) and had an excellent meal of all the Greek foods I love plus one new dish for me, soutsoukakia, a tender minced meat kebab with delicious seasonings. We only had a couple of days in Kilkis so the next day Penny's Theo went into tour guide mode and took us to see all the required sites; the Kilkis archeaological museum, the famous caves (where they want to start "cave-therapy" for kids with asthma) and the lake on the border with Serbia. We were also introduced to the schedule we would keep for the rest of our time in Greece; wake up at 8 or 9 AM and have frappee but no food for breakfast, siteseeing or other activity until 2 PM then eat a massive meal (the word lunch doesn't do it justice), sleep from 3 PM to 6 PM, wake up and have another coffee and talk till 10 or 11 PM then have a light dinner (the word "light" is relative, remember this is Greece). Get to sleep around 2 AM. We both had a great time in Kilkis, getting to know Penny's family and seeing a beautiful part of the country that is off the usual tourist path. After saying goodbye to Tara and Lora, Joe and I were on our own again. Our next and final destination before returning home is Greece. Being true budget travelers, we chose the cheapest flight we could find from Rome to Athens. We flew with AlItalia with an overnight layover in Milan. We took a look at the website www.sleepinginairports.com to see what other travelers had to say about the Milan Linate airport. The reviews were good and we took some of the advice that other travelers had posted: use the subsidized employee vending machines, find the armless chairs at the departures area... Other than being woken at 1:30 AM by Italian speaking security guards who wanted to see our tickets (you are only allowed to sleep there if you have an outbound early morning flight), the night went smoothly. The next morning, we hopped on the Milan to Athens plane. We arrived in Athens a little groggy but overall excited about our final 2 weeks. The enthusiasm started to wane when we realized that our luggage had not made it to Athens with us. We were able to laugh about it - in the past 11 months of travel we have never lost our luggage. How ironic that we would lose our stuff on a short flight on an airline from a “developed” country. We filled out the appropriate paper work and were told that AlItalia's track record with luggage was one of the poorest in recent months, but not to worry. Our luggage should be found and delivered to us shortly. We were given 3 different phone numbers that we could call to get updates and a file number for reference. We exited the arrivals area and were greeted by my cousin Nancy. It has been five days since we have arrived in Greece and I have yet to get my backpack. Joe's was delivered the second night we were in Athens, but mine is still missing. It has also been five days that we have been calling the three numbers that we were given to inquire about my luggage but not once has anyone answered the telephone. We even went to the Athens airport to get some answers and I was told that I needed to be patient. My patience has run out! We delayed leaving for northern Greece by one day in the hope that my luggage would arrive. After spending three days in Athens, we decided to leave anyways. I packed one T-shirt that I bought and a pair of pajama shorts that my cousin gave me and we took the seven hour bus ride to Kilkis. It has not been fun. Every second night, I have been washing my one set of clothes and leaving them to dry overnight. On the bright side, it has made picking what to wear in the morning much easier. It is now Friday and we are still waiting for a telephone call (we arrived in Greece on Sunday morning). 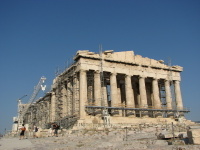 We will have to return to Athens for one more night on Saturday to either pick up my luggage or go for a small shopping spree. On Sunday, we take a four hour bus ride to my mother's home town where we will attend the annual village festival called 'panigiri'. My mom's village of Agia Sotiro celebrates on September 6. The village square is transformed into a fair ground where music is played and roasted pig (with only bread and nothing else) is sold. The village of only a few dozen full time residents is transformed into a real party place. I hope to be able to wear the little dress that I bought in Italy, but I will not hold my breath! P.S. We are a little late posting this... So I finally received my bag six days after I arrived in Greece and after 3 trips to the airport!